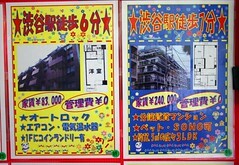 A one bedroom flat for 83,000 yen a month, a three bedroom flat for 240,000 yen a month. Not cheap. And yet more and more Japanese are predicted to converge on the cities while the population density (and houseprices) in the countryside falls. In some parts of Japan houses are so cheap that they are given away. Most Japanese think that the Japanese like nature. Even if this is the case, it is also true that the Japanese like to live in cities not in nature even more. When I ask Japanese people, "Why do you Japanese prefer to live in rabbit hutches next to urban stations, rather that in the splendor of the Japanese countryside?" they tell me that the environs of urban stations are more convenient, especially for work. Yes, this is surely the case. But why to Europeans value work less than the Japanese? Why do they prefer to live in nature more? If you had the the option of big bucks in a metropolitan rabbit hutch, or a pittance in a rural nowhere, which would you choose?